The 900 is the only Rotring fountain pen I have ever owned. I have not been a fan of Rotring’s tool-like design nor their (generally) scratchy nibs but my 900 is an exception. The 900 is an excellent industrial design that is more in tune with Lamy’s Dialog line than drafting-pencil-look that Rotring is famous for. 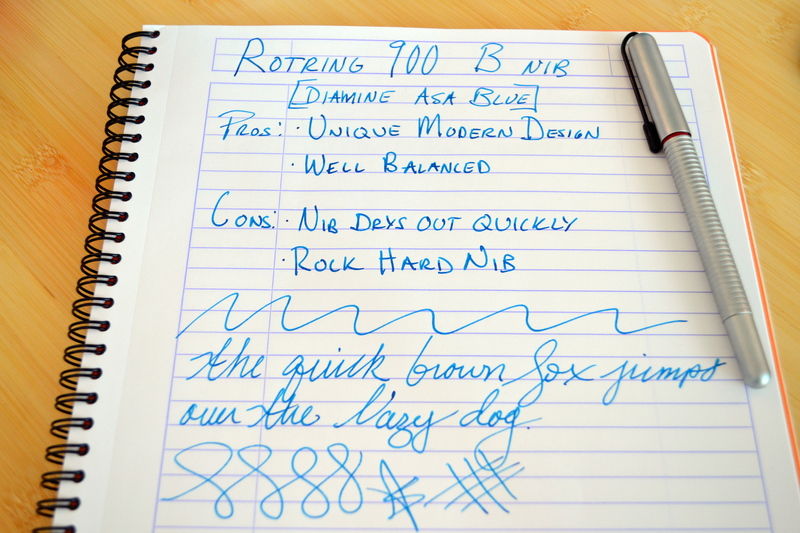 The 900, like the better-known Rotring 600 fountain pen has long been discontinued. They both share the same undecorated nib and were both designed as pencils first. 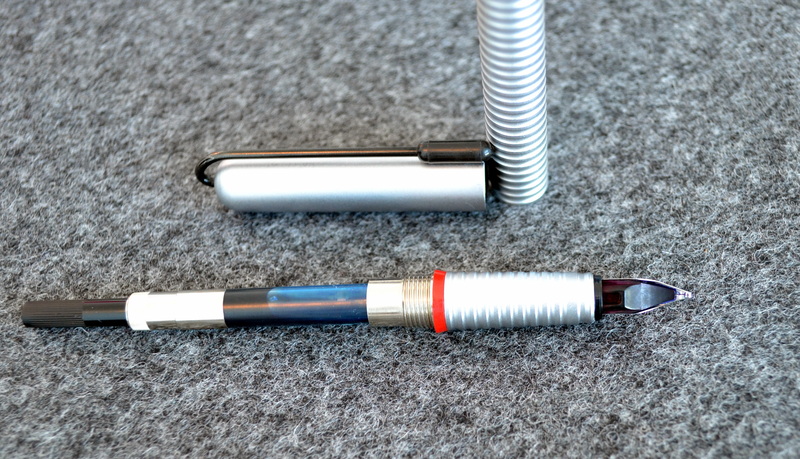 The Rotring 900 pencil had a very interesting “side knock” mechanism that required you to bend the pencil in the middle to advance the lead…the fountain pen’s mechanism is decidedly less interesting, with a standard cartridge/converter filling system. 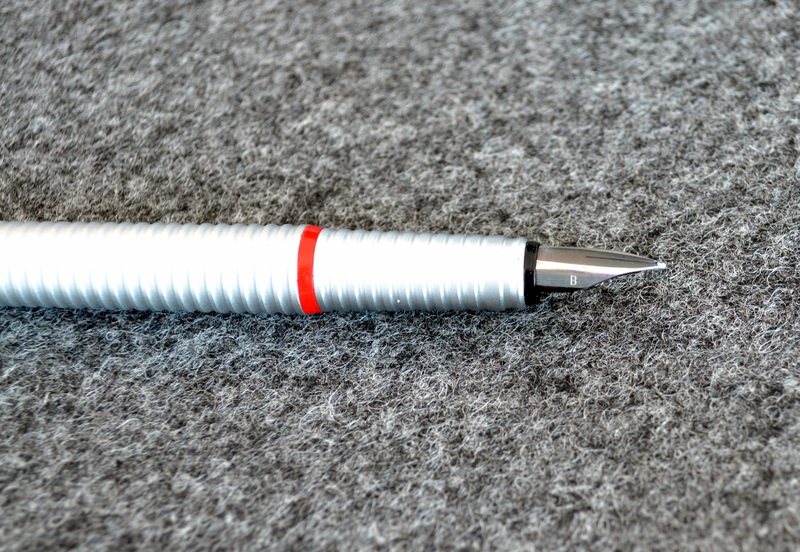 The Rotring 900 has a beautiful grooved barrel and section with an unusual black clip that sort of looks like a paper clip. The grooves are deepest at the section and get shallower as they make their way down the barrel. The cap meets the section at the red ring. I believe this pen is made entirely out of machined aluminum based on its color and the way it scratches. Capped this pen measures 15cm and weighs a hefty 37.8 grams (with converter and ink). The pen is surprising well balanced while posted and makes for a comfortable writing experience. I am not normally a fan of metal pens as they make my fingers sweat but the combination of the grooved section and matte finish work very nicely for me. The broad nib is a nail but it is smooth and does offer some minimal line variation. This is the first broad nib Rotring I have used but in my experience the fine and medium nibs on the half dozen or so Rotring 600s I have tried were a bit too scratchy. I have found that the pen left uncapped for a couple of minutes will dry out, though it is easy to get flowing again. The matte finish does scratch as you can see in the picture below and I have also noticed that the cap requires a good bit of force to uncap. The Rotring 900 isn’t really a good fountain pen (like most Rotring fountain pens) but it’s attractive design and good balance are justifiable reasons to keep it in my collection. Interesting. I’d never heard of the 900. I have a 600 (broad nib) and a Newton (fine nib that lays down a line almost identical to the 600’s broad nib…). The 600 is a smooth and pleasant to write with. The Newton is scratchy. Thanks for your comment. The 600 uses the same nib as the 900 so the writing experience should be the same though I suspect the smoothness varies between Rotring nibs much like Lamy. Rotring makes tool pens, so consistency in feel and smoothness is not as paramount.